Sensitivity : The Creative Diagnostics FOB card test can detect the levels of human occult blood as low as 50 ng/mL hemoglobin or 6μg hemoglobin/g feces. 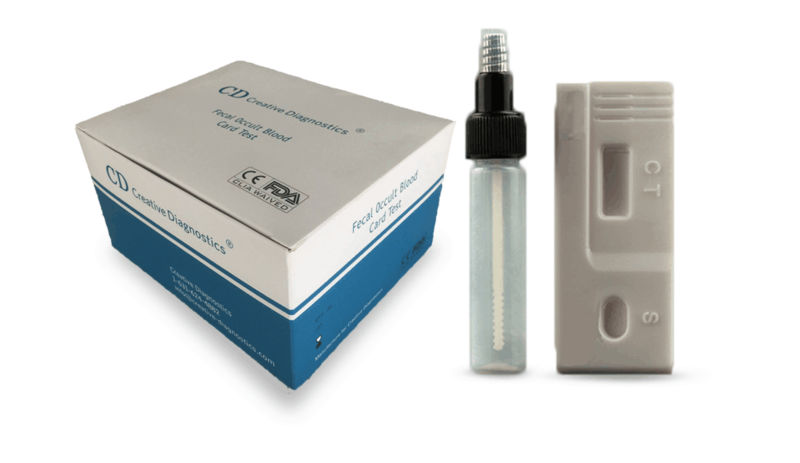 The Creative Diagnostics FOB card test is a lateral flow chromatographic immunoassay based on the principle of the double antibody–sandwich technique. The membrane is pre-coated with anti-hemoglobin antibody on the test line region of the device. During testing, the specimen reacts with the particle coated with anti-hemoglobin antibody. The mixture migrates upward on the membrane chromatographically by capillary action to react with anti-hemoglobin antibody on the membrane and generate a colored line. The presence of this colored line in the test region indicates a positive result, while its absence indicates a negative result. To serve as a procedural control, a colored line will always appear in the control line region indicating that proper volume of specimen has been added and membrane wicking has occurred.